Alfred Spates, Esq, President of the Chesapeake and Ohio Canal Company, reports to the editor of the Washington Chronicle, of the 1st instant, that “the Canal has never been in so good order as at this time, and, therefore boats run night and day.” About twenty-three hundred tons of coal are shipped daily to Georgetown from the mines. Very little of the coal stops at Georgetown, but it goes on to the Northern cities upon return voyages of vessels that bring cargoes from those points to General Grant’s army, to Point Lookout and to Washington, Alexandria and Georgetown. 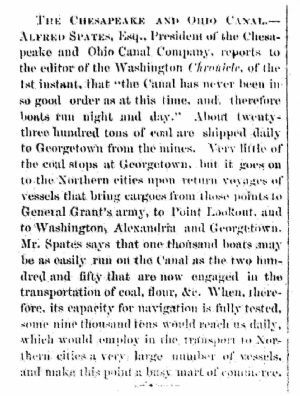 Mr. Spates says that one thousand boats may be as easily run on the Canal as the two hundred and fifty that are now engaged in the transportation of coal, flour, etc. When, therefore, its capacity for navigation is fully tested, some nine thousand tons would reach us daily, which would employ in the transportation to Northern cities a very large number of vessels, and makes this point a busy mart of commerce.